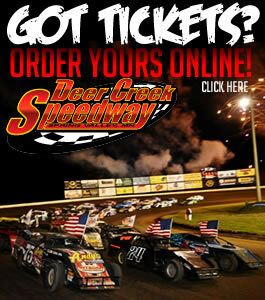 SPRING VALLEY, MN – July 8, 2012 (Photo Courtsey of Buck Monson Photo): The 33rd Annual Gopher 50 Charity Late Model Race featuring the World of Outlaw Late Models will go down in the record books as one of the best features at the Deer Creek Speedway. With a three wide battle for the win as the white flag flew who would win was up for grabs. 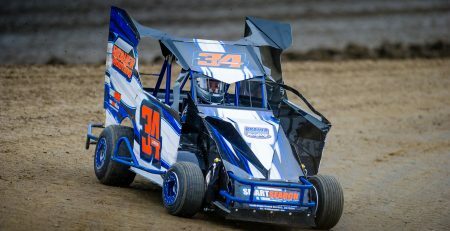 Earlier in the night Chad Simpson of Mt Vernon Iowa’s topped the 31 car field in Qualifying turning a 14.550 second lap time, Jimmy Mars and Shane Clanton rounded out the top three in qualifying. Heat race action went to the Clint Smith, Tim McCreadie and Clanton. Mike Prochnow won the B-Feature event. Shane Clanton jumped into the lead out of turn two on the opening lap of the $10,000 to win feature event. Clint Smith moved into second with Tim McCreadie and Darrell Lanigan in third and fourth. 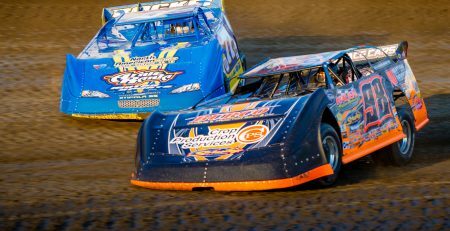 Lanigan and McCreadie had the battle for third early on swapping spots at the scoring line. With nine down Clanton already started lapping slower cars. Lanigan moved into the third spot on lap eleven as Clanton pulled out to a half straight advantage over Smith. Brian Birkhofer sat in fifth and started to pressure McCreadie for the fourth spot on lap sixteen. With nineteen down Lanigan was on Smith rear bumper as they worked through traffic and tried to gain ground on Clanton up front. On lap twenty Clanton got held up as Smith pulled alongside through one and two. In three and four Smith got held up allowing Clanton to hold onto the lead while Lanigan took over the second spot. Two laps later the front three were nose to tail as they came up on a large pack of cars racing for their positions. The caution flew on lap twenty nine as the leaders were just getting through the pack of cars with Smith and Birkhofer getting collected in the accident and pulling pit side for repairs. On the restart Clanton led with Lanigan and McCreadie in pursuit. Chubb Frank and Rick Eckert raced for the fourth spot just ahead of Jimmy Mars in sixth. With just fifteen laps remaining Lanigan and McCreadie were still hard at it for the second spot. By lap forty the top three were running close around the speedway with McCreadie running low and Clanton and Lanigan up higher on the racetrack. Two laps later they started to work into lap traffic again with McCreadie taking second on lap forty eight. As the white flew the top three exited turn two three wide for the lead, Clanton moved lower into turn three messing up McCreadie’s low line through three and four and then sliding up to block Lanigan’s exit out of turn four to take home the win and the $11,000 paycheck that went with it. The crowd went nuts during the last lap without a fan sitting down watching the most exciting finish ever to a Gopher 50 feature event. Frank and Eckert rounded out the top five. 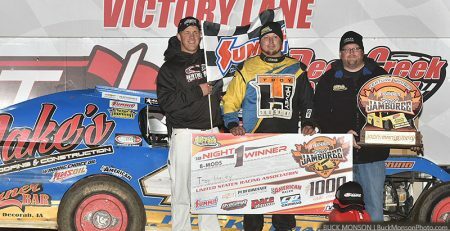 The final event of the night was the $2,000 to win United States Modified Touring Series Feature event with Rodney Sanders jumping out into the early lead. Joey Jensen moved into second with Steve Wetzstein in third. A three car battle for sixth, behind Jon Tesch and Mike Steensma early on was heated. Tesch moved third on lap seven. Jensen hung with Sanders early on waiting for a mistake. On lap twelve Ryan Gustin, Steensma and Brandon Davis were racing hard for sixth. Two laps later the leaders were working lap traffic and with sixteen down Gustin took over the fifth spot. On the restart Sanders led with Jensen in second. Gustin and Tesch now raced for third with Wetzstein in fifth. Another restart on lap nineteen saw Sanders leading with Tesch taking second and Jensen in third. Tesch pushed up the next lap allowing Jensen to move back into second. Davis followed Jensen through to take over the third spot. With twenty three completed Davis moved under Jensen for the second spot as Tesch and Gustin raced for fourth. Another caution on lap twenty seven saw Sanders leading. Davis sat in third and started to work his magic on the low side of the speedway. On lap thirty Davis took over the lead while Jason Cummins, Tesch and Gustin battled hard for fourth. Davis pulled away from Sanders to take home the win. Jensen, Gustin and Cummins rounded out the top five. 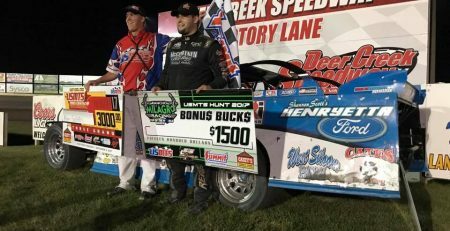 Cole Queensland, Steensma, Bob Timm, Tesch, Wetzstein and Jason Miller took home heat wins while Kelly Shryock, Cummins and Gustin won the “B”-Features. This year’s Gopher 50 event will be an event talked about for years to come with close exciting racing. Racing action will resume next Saturday with all six regular classes back in action at the speedway.